It was strange being back in the village after so long. Not much had changed – a lick of paint here, a single-storey extension there. But Jack had changed. She wasn’t the silly love-struck teenager that had left ten years ago, weeping her way to the train station, sobbing her way to Leeds to embark on a brand new life away from her parents and boyfriend Tom. It wasn’t as though she was leaving Tom behind; he was going away himself, even further afield than Jack, and they’d made the sensible, grown up decision to temporarily break up. Jack soon came to the conclusion that being a grown up sucked. She missed Tom terribly and took to stalking the postman on the off-chance that Tom would break their no-contact rule (another stupidly mature decision) and send her a letter or even a hastily scribbled postcard. When she received nothing (not even a Christmas card – good old Tom, sticking to the rules), Jack drew comfort from the fact that the break-up wouldn’t last forever. They’d meet up again when they had their degrees and they would live happily ever after. Except it hadn’t quite worked out like that. Jack tightened the belt around her coat, cocooning herself against the bitter late October chill as she wandered into the heart of the village. The Green was just as she’d left it; neat and cheerful with an array of pretty shops and the red telephone box (yes, they still had one of those), shiny and bright against the gloom. No, she wasn’t the love-struck teenager that had left Hartfield Hill behind. If only! She’d give anything to go back to that age of naivety, where the worst thing that could ever happen was parting with your boyfriend, where she had never experienced true heartbreak and Tyler Aspen wasn’t even on her radar. When the dream of reuniting with Tom was still very much alive, before Tom landed himself his dream job – in Queensland – and Jack found Tyler. Jack’s fingers moved to her left hand, brushing against the empty space where her wedding band had once nestled, though admittedly not for very long. Marrying Tyler had been a massive error in judgement. Tyler was handsome with a cheeky-chappy charm, but he was also lazy and irresponsible and it transpired that he couldn’t keep his little pal in his trousers for more than a few days. He was indiscriminate and indiscreet in his unfaithfulness and in the end he couldn’t even be bothered to apologise for the man he was. So here Jack was, less than eighteen months after saying ‘I do’, licking her wounds and trying to fathom why she had ever said yes to Tyler’s proposal in the first place. Yes, she’d loved him, but had he ever truly been The One? Jack shoved her hands deep into her pockets and, head down against the harsh wind, she made her way across The Green, pausing outside her aunt’s tearoom. The large window had steamed up as the delicious smells of baking wafted into the cool air. 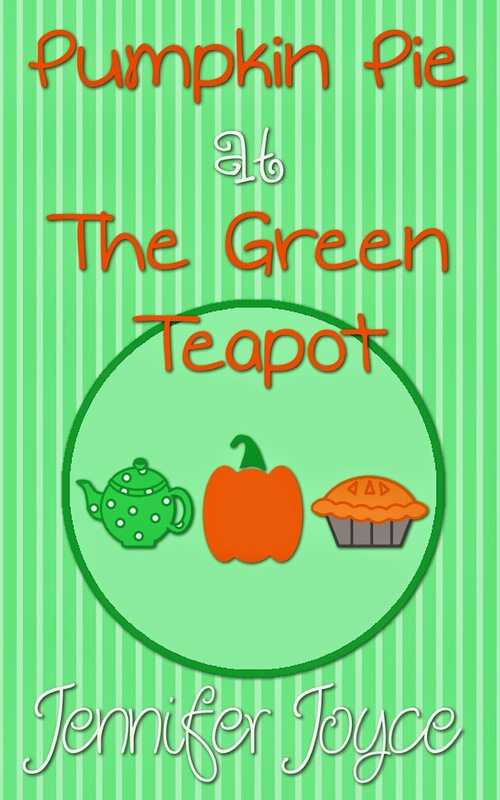 The Green Teapot was Jack’s favourite place in the village – possibly her favourite place in the whole world – with its cosy interior and delightful cakes and biscuits. The Green Teapot was a happy place. A warm place where people gathered to chat, to reminisce, to celebrate. Jack had spent many wonderful hours in the place, either nestled in a corner with her books, a bun or apple pie taking away the sting of homework, or chatting with her friends after school, imagining they were oh-so-sophisticated and just a little bit like Carrie Bradshaw. She felt a blanket of ease envelop her as she pushed open the door and stepped inside, the old memories rushing to the surface, replacing the more recent bitter ones. She felt at home, comforted by the familiar surroundings and she found that she was grinning as she stepped over the threshold. ‘Pumpkin pies. They’re still in the oven but they’ll be ready soon. We’re having a competition for Halloween.’ Enid indicated behind them, where the tables were occupied by eager youngsters and their parents. Each table held a large pumpkin and kid-friendly tools. Jack’s eye was immediately drawn to the table in the centre of the room, where a little boy sat, his tongue poking out of the corner of his mouth as he concentrated on the pumpkin in front of him. Next to him, eyes boring into Jack’s, was Tom. ‘Hey, Jack.’ Tom was on his feet, eyes crinkled as a welcoming smile lit up his face. He bundled Jack into a tight hug without hesitation, almost lifting her onto her tiptoes in his eagerness. ‘You’re back then.’ Tom had settled in Australia the last Jack had heard. Why hadn’t her mother told her he was back in the village? ‘Yep. Moved back a few months ago.’ He looked down at the small boy, who had toddled away from the table and was tugging at Tom’s jumper. He had the same white-blond hair that Tom had once had as a child before it darkened into the dirty blond it now was, though the boy’s lips were much fuller and his nose wider. Perhaps he’d inherited those features from his mother. ‘What’s up, little buddy?’ Tom hoisted the child onto his hip, tousling his white-blond hair. ‘Finished.’ The boy pointed back at the table, at the pumpkin with its jagged triangle eyes and crooked mouth. So Tom had done the settling down and having kids thing. No wonder her mother had kept quiet about his return. Tom’s obvious happiness was like rubbing salt into Jack’s gaping wound. She gave a wobbly sort of smile as Tom and the boy headed back to the table to take the photo. The boy posed in front of the pumpkin, his lips wide in a toothy grin as Tom captured the moment on his phone. Good for him. Tom deserved to be happy. He was a good man who had always had a big heart. Jack should have found herself someone like Tom instead of waste-of-space Tyler. Or perhaps she should have fought harder for Tom and moved to the other side of the world with him. How different would her life have been if she’d been braver? If she’d married Tom instead of Tyler? Would they have had a sweet blond-haired boy by now too? Jack certainly wouldn’t be sleeping in her childhood bedroom, crying herself to sleep and worrying about the future, that was for sure. But it was too late. You couldn’t go back, could you? ‘Pumpkin pies are ready!’ Enid had disappeared into the kitchen but she returned now, brandishing a tray of individual pies fresh from the oven. ‘Would you like to join us?’ Tom asked as he helped himself to a pumpkin pie for himself and the child. ‘I’d love to.’ What harm could it do? Catching up with an old friend was a normal, healthy thing to do. It shouldn’t matter that she had once loved this man in the way only an impassioned teenage girl could. That he had been her first love. That she had imagined they would spend an eternity together in a blissful summery existence. Those images had long since fizzled out – about the same time she had ceased trailing the postman – and had been replaced with other, equally unrealistic daydreams. ‘So who is this then?’ Jack sat at the table, trying not to look directly at the pumpkin. It was rather sinister up close. Instead, she focused on the little boy, whose mouth and jumper were already scattered with pastry crumbs. ‘I’m Max.’ Crumbs pelted out of the boy’s mouth, raining down on the table. Tom quickly gathered them into the palm of his hand and deposited them into Max’s empty pie case, apologising profusely. News – or gossip – still travelled fast around these parts then. ‘It’s stepped up a gear, I’m afraid. You’re looking at a soon-to-be divorced woman.’ How sad was that? She wasn’t even thirty yet and she’d already clocked up a failed marriage. ‘I’m sorry.’ Tom reached across the table and took Jack’s hand in his. The contact was so familiar, Jack could have been transported back a decade. She could have been sitting in The Green Teapot with a sticky pecan bun, a stack of books and butterflies in her tummy as Tom assured her she wouldn’t fail her A Levels in a spectacular fashion. Jack laughed, the sound alien after so much recent misery. ‘Me too.’ Tom squeezed Jack’s hand, their eyes meeting over the freaky-looking pumpkin, but the moment was broken when Max, having shoved three-quarters of a pumpkin pie into his mouth, started to gag. Tom’s hand was snatched away as he leapt into action, grabbing fistfuls of napkins while Jack went in search of juice. When she returned, the pie had been removed from a sheepish-looking Max and he drank thirstily from the proffered glass. ‘Sorry about that.’ Tom looked equally as sheepish as the boy. ‘Can’t you stay? Just for a few more minutes?’ Tom reached out, but Jack moved her hand away. Seeing Tom had dredged up all her old feelings and reminded her of all those happy times they’d shared, their promises and the plans they’d made for life post university. Plans that had never happened. It was too much to bear on top of everything else. So Jack stayed. Just for a few minutes, she told herself. She would judge the pumpkin competition and then she would go home and put Tom to the back of her mind, where he belonged with all things labelled ‘The Past’. The pumpkins were lined up in the window of the tea shop, fat candles flickering inside as everyone gathered outside to witness their hard work in all its glory. ‘Do you think we’ll win, Uncle Tom?’ Max asked. They were lined up on The Green awaiting the results, noses already pink from the cold. ‘Oh. I see.’ So Tom hadn’t done the settling down and having kids thing after all. ‘Shall we announce the winner then?’ Enid asked from the front. Tom took hold of Max’s little hand, giving it a good-luck squeeze and ignoring the slight stickiness. Turning to Jack, he took her hand too. And this time she didn’t pull away.